September is Hunger Action Month. For two years now I have taken action by staying awake for over 24 hours straight, raising money and awareness for hunger relief. And this Friday I will do it again. The third annual #FoodBank24: A New Media Telethon kicks off at noon at the Raleigh Headquarters of the Food Bank of Central & Eastern North Carolina. We set up a table, web cam, and produce our own variety show of sorts, streamed through the Food Bank’s website for 24 hours. As the host, I interview Food Bank staff, donors, volunteers, and other community members that are doing their part to help feed local families in need. We also organize events for the public to get involved such as a Food Truck Rodeo, a family-friendly Mixer with free food and fabulous prizes, and a midnight volunteer session. All with a goal of raising $60,000 to provide 300,000 meals and raise awareness of hunger in our region. That’s me interviewing the Carolina RailHawks at last year’s event! Hosting a fundraiser for 24 hours may seem like a huge task. And I’ll be honest with you—it is. 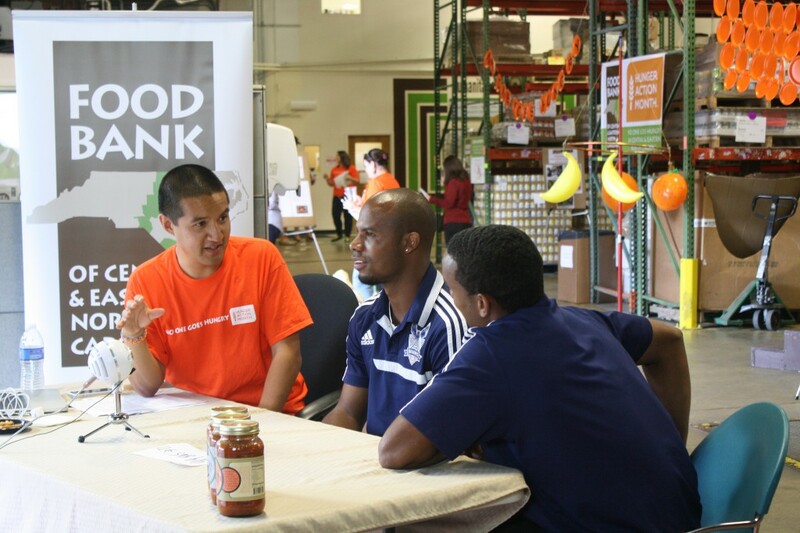 The #FoodBank24 team plans this event for months. Little by little we fill in a production schedule that is over three pages long, sending dozens of emails to community members, sponsors, and even local sports mascots. We manage the never ending task list with everything from arranging large food trucks in a small parking lot, to reserving a dunk tank, to decorating our own selfie photo booth. For weeks we scour local stores for all things orange, from streamers to napkins to candy corn. Then we pack our overnight bag, head to the Food Bank, and mentally prepare ourselves to work a massive event that rolls for 24 hours straight. It’s a big job. But ending hunger in Central & Eastern North Carolina is bigger. And for 24 hours, we have the opportunity to tell everyone about all the ways the Food Bank helps the community including child nutrition programs, organizing volunteers, helping partner agencies expand their services, and inspiring people like me to get involved and donate their time, money, or voice. When I tell people about this event, the number one question I get is, “How do you stay awake for 24 hours?” The answer is simple: I take it one minute at a time. I like this philosophy because I feel it applies to the work of the Food Bank and their mission in every way. In their 34 county service area, 651,000 people live in food insecure households. So many of our neighbors live day-to-day, one meal at a time. These people struggle with how to feed their families, not always knowing where their next meal will come from. I take this challenge one minute at a time, and I encourage you to do the same. Sign up to volunteer, one day at a time. Help provide meals to a child in need, one dollar at a time. Spread the word about the hunger epidemic in our region, one person at a time. Every journey begins with the first step. Mine will be at noon this Friday. What will yours be? #FoodBank24: A New Media Telethon begins at noon on Friday, September 26. Grab a friend, kick back, and watch the show here: www.foodbank24.org. All you need is your computer and internet connection! Or better yet, come to our Raleigh Headquarters and see the action in person! On Twitter? Search #FoodBank24 to follow our progress! Want to help make a difference? Donate what you can. Remember, for every $1 donated, the Food Bank can provide 5 meals to a family in need!